Finally, bars worthy of the Legend name. Machined, tested and manufactured in the USA. Excellent .. The bar shaft is made from precision ground alloy steel and the strength of the shaft is tested with.. The bars were designed with perfection in mind. Featuring a 1-1/4" diameter (31.75MM), they fit all .. The American Barbell Training Bar is a solid, versatile barbell for just about any application. The ..
Machined, tested and manufactured in the USA. Great strength, sleeve spin and whip characteristics c.. 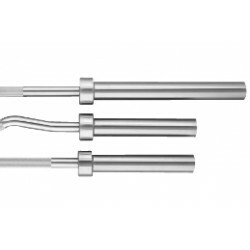 The bar shaft is made from precision ground alloy steel. The strength of the shaft is tested with ev..